Collect clean snow from winter storm. Store in a safe location. Heat maple syrup until bubbly and pour over fresh snow. 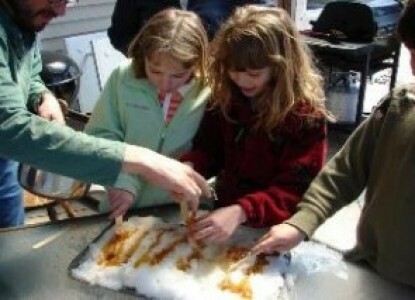 The warm syrup crystallizes when reacting with the cold snow. What starts as a stretchy, taffy-like texture gradually becomes rock hard. If you have received a plastic spoon, it now becomes pretty useless. Use your fingers.